These wise words are as true today as they were more than two hundred years ago when Benjamin Franklin first made this statement. That Franklin was one of the foremost minds of his time is well known. Yet, clearly, he also understood the value of using his hands as well as his head when it came to learning. Franklin knew that science isn’t just a collection of facts. You can no sooner understand science by memorizing facts than you can understand music by memorizing a score. You have to do science just like you have to play music to really “get it.” What better way is there to shape our minds, expand our knowledge, and enhance our understanding of physical science than hands-on experimentation fueled by curiosity? Franklin’s insatiable curiosity, love of science, and hands-on approach led to numerous discoveries and inventions, especially in the area of electricity. The story of his kite-flying experiment during a thunderstorm has become part of American lore, and the lightning rods that he invented are still saving property and lives to this day. However, despite the many advances in, and widespread use of, electricity since Franklin’s time, it is understood surprisingly little. Electricity is such an integral part of our daily lives that it would be difficult to imagine society today without it. Yet, we normally cannot see, taste, smell, or touch it. So, what is it? Generally speaking, electricity can be described as “the flow of electrons in a conductor.” Electrons are negatively charged subatomic particles (extremely small parts of an atom). They travel in orbits around the protons and neutrons of an atom’s nucleus, much like the planets in our solar system travel in orbits around the sun. Experience tells us that electricity doesn’t flow through everything. If it did, we’d get a shock every time we turned on a lamp or plugged in a vacuum cleaner. Once again the Creator has revealed His genius. He has provided us with both conductors to carry electricity and insulators to safely separate us from it. Insulators, then, are the opposite of conductors. They hold on to their electrons so well that current does not flow through them. If you’ve ever been shocked after walking across a carpet in socks and then touching a doorknob, you’ve experienced static electricity. As a result of your feet rubbing across the carpet, a negative charge built up on your body. That charge had nowhere to go (hence the term static) until it encountered the metal doorknob and discharged all at once. You can perform a simple static electricity experiment at home with a balloon and a piece of paper. Begin by rubbing the blown-up balloon vigorously against the hair on your head or against a wool sweater; then hold the spot that was rubbed up to a wall and let go. The balloon will stick. The rubbing pulled electrons from your hair to the balloon. Since electrons don’t flow in an insulator (such as the latex balloon), they stay put, and the negatively charged portion of the balloon is attracted to the wall. Now tear up the paper into small pieces and rub the balloon again. You can pick up the small bits of paper with the charged portion of the balloon. A strong enough charge will actually cause the pieces of paper to leap up to the balloon. Electricity doesn’t do us much good unless we can control it in order to do useful work. Scientists learned to do this with circuits. First, they discovered that a circuit must be complete in order for the electricity to flow. Think of a circuit as a circle. When the circuit is complete, electricity can flow; we call that a “closed” circuit. When there is a break anywhere in the circuit, electricity cannot flow, and we call that an “open” circuit. Second, electricity is lazy. It will always follow the path of least resistance. Here’s a simple circuits experiment you can do with your children. 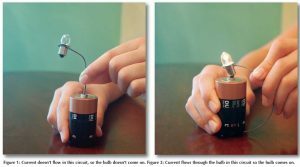 All you need is a battery (AA, C, or D will work), a small piece of wire, and a flashlight bulb. If you don’t have them at home, you can get the wire and bulb from any hardware store, electronics store, or the science fair section of a hobby shop. We used some surplus electric fence wire we had at home and borrowed a bulb and battery from a flashlight. Connect the bulb to one side of the battery as shown in Figure 1. We’ve connected the bulb to an energy source, so why doesn’t it light up? It doesn’t light up because it’s an open circuit: there’s no path on which the current can get back to the other side of the battery to complete the circuit. Now connect the circuit as shown in Figure 2. The current flows through the bulb back to the battery and the bulb lights up. Congratulations, you’ve just created a working circuit! Connect one end of the battery to the bulb. Connect one jumper wire to the other side of the battery and the other jumper wire to the other side of the bulb. (See Figure 3.) Now when you touch the loose ends of the jumper wires together, the circuit is complete and the bulb lights up. So if we put a conductor between the free ends of the jumper wires, the bulb will light. If we put an insulator there, the bulb will not light. Metals will usually conduct; experiment with coins, keys, pencil lead, foil gum wrappers, etc. Non-metals will usually insulate; experiment with plastic cups, glass, painted objects, wood, etc. Have your children record their predictions before they test an object, and then record the results after the tests. This can lead to a discussion of the properties of conductors and insulators. They may be interested to know that materials that are good conductors and insulators of electricity are also good conductors and insulators of heat. Through these simple experiments, you’ve begun understanding the fundamentals of the technologies that play an increasing role in our modern lives. So don’t let the fun stop now. 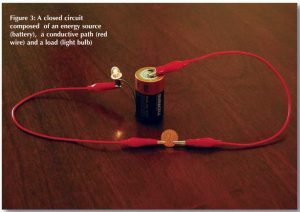 Add electric circuits to your curriculum. There are a number of hands-on teaching materials available today (although attractively packaged, don’t settle for toys), and parents need not be engineers to help their children fully, safely, and correctly learn about electric circuits. Copyright 2008. Originally appeared in The Old Schoolhouse Magazine, Fall 2008. Used with permission. Diet Coke and Mentos: What’s Really Going On?